SAN DIEGO, CA--(Marketwired - Nov 7, 2013) - VirBELA, CYBERSPACE - A team of four MBA students, with members living in the UK, India, Singapore, and Japan, navigated cash flow issues, carbon emissions caps, and time zone and cross-cultural communication challenges to manage a mock car company in a virtual world to claim US$28,000 in real cash. The team of Ankita Solanki (Indian Institute of Management-Ahmedabad), Carine Toutet (INSEAD-Singapore), Laimona Staskus (London Business School) and Wang Lu (Waseda University, Japan) prevailed over seven other international teams in the Global Business Competition, held in October to launch VirBELA, a 3D virtual world designed specifically to harness the power and demonstrate possibilities of gamification and online collaboration in business education. "VirBELA offered the opportunity to view the interaction of the core competencies taught in business school in a global interactive business environment," said participant Brady Chung, an MBA student at the University of California San Diego Rady School of Management. "This experience reinforced the importance of synergistic teamwork, especially and in light of having teammates spread across the world, in order to be successful in business. VirBELA also provided the invaluable teaching lesson of learning from one's own failures. Our team made some missteps in the beginning, but with analysis, insight, and input from one another, we were able to overcome our early shortcomings and achieve success." The Business Simulation challenged the eight teams of three or four MBA students from top business schools around the world to build sales, improve profitability and maximize shareholder value over 16-20 virtual quarters. The competition was held in VirBELA, with student teams working together through avatars with text chat, voiceover IP, and 3D visuals of company assets. VirBELA is hosted by the University of California San Diego Rady School of Management and Rembisz & Associates with funding from the Graduate Management Admission Council. "VirBELA is about creating opportunities for MBA students to network with colleagues around the world and to practice working on remote multi-national teams," said Alex Howland, program director and founder of VirBELA. "While we were excited to see our new technology work well with a global audience, the real accomplishment was watching teams form and grow. Team cultures developed and transformed throughout the competition as teams had to work through both the task of the simulation, as well as the process of how they approached it. The inaugural competition certainly showed potential of how VirBELA can build a global MBA community and help prepare tomorrow's global leaders." Howland and VirBELA co-founder Ronald Rembisz won $1.7 million in start-up funding for VirBELA from the Graduate Management Admission Council in an international competition to spur management education innovation. Howland and Rembisz were the only double winners in the GMAC Management Education for Tomorrow's Ideas to Innovation Challenge, both for the virtual world idea itself and for the project, which is run by the Rady School and Rembisz & Associates, a consulting firm. "VirBELA is ideal for providing a platform for experiential learning and collaboration around the world. It can bring together students and faculty from around the world for classes, virtual events, and groups. Business schools have embraced gamification as a way to give students experience making business decisions and living with the consequences in accelerated time frame in a no-risk environment," said Allen Brandt, GMAC MET Fund director. "Business is becoming more global, so management education has to become more global, and VirBELA will allow students and educators all over the world to collaborate and learn from each other." VirBELA uses cutting-edge technology to create a place where people can interact in real time with others from all over the world. The virtual campus will allow for not only experiential learning simulations but also team-taught classes across countries and continents, and group learning projects conducted in real time. In the Global Business Competition, each team worked with a professional facilitator trained in organizational psychology who debriefed the team at the end of each session to help them better understand their team processes regarding decision making, conflict management, and collaborating across cultures. Students quickly discovered they brought their real-world selves and behaviors with them to the virtual space. "The way in which VirBELA is different than other business simulations is that your team is spread across several different countries," said Suket Murarka, whose team finished second. "For instance, my team consisted of people from Singapore, London (UK), San Diego (US), while I am at Ahmedabad (India). This setting provided us another complexity, deciding on timings to meet before we could even discuss strategies and make decisions for the simulation. It was an exciting process to first get to know people on your team just through voice, connect with everyone and understand them. At first this was difficult, but as time progressed, it became natural to us. We all realized that one does not need to be physically present to collaborate across geographies." First place, $7,000 for each team member: Team GO CAR: Ankita Solanki (Indian Institute of Management-Ahmedabad), Carine Toutet (INSEAD-Singapore), Laimonas Staskus (London Business School) and Wang Lu (Waseda University, Japan). Second place, $3,000 for each team member: Team Everest, Brady Chung (UC San Diego Rady School of Management), Jaime Hung, (INSEAD-Singapore), Stephanie Voigt (London Business School), Suket Murarka, IIM-Ahmedabad. Third place, $1,500 for each team member: Team Sawari, Kenji Watanabe (Waseda University); Arda Varilsuha (UCSD Rady), Jubin Goyal (IIM-Ranchi, India), Linda Lee (INSEAD-Singapore). The Graduate Management Admission Council (gmac.com) is a nonprofit education organization of leading graduate business schools and owner of the Graduate Management Admission Test (GMAT exam), used by nearly 6,000 graduate business and management programs worldwide. GMAC is based in Reston, Virginia, and has regional offices in London, New Delhi and Hong Kong. The GMAT exam (mba.com) -- the only standardized test designed expressly for graduate business and management programs worldwide -- is continuously available at more than 590 test centers in 110 countries. The GMAC Management Education for Tomorrow Fund invests in strategic philanthropic initiatives that benefit business and management education globally. For more information about GMAC, please visit gmac.com/newscenter. Rembisz & Associates (R&A) is an international consulting firm of organizational psychologists and management consultants utilizing psychological assessment and development principles to increase organizational performance through the enhancement of individual leadership and team effectiveness. They assist in executive assessment and selection, executive coaching and leadership development, team building, and in organizational development and change management. To learn more about Rembisz & Associates, visit rembisz.com. 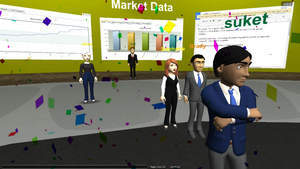 Team Everest competes in the business simulation competition in the VirBELA virtual world.